My grandkids were over here for a weekend while my daughter attended a workshop. I took the kids out for the day knowing she was set to return around 5pm. I would imagine that all of you have had a day or days where you are just plain out of meal ideas, particularly those of you with young children. If not out of ideas for what to make for dinner, then possibly you are short on time or dealing with picky eaters. Or all of the above. Such was the case on this particular Sunday. The grandmother (ME!) looked like a superhero when I offered to quickly make dinner to send home with the family. I drove to the neighborhood meat market which has fantastic, single source ground beef. Next I hit a supermarket where I purchased hamburger buns. Sadly, they did not even have my preferred multigrain buns so I bought those soft, white enriched buns. Which make me gag. But hey, the kids loved them. I came home and in a flash, the meal was ready for transport back home. I included a large can(!) of vegetarian Bush’s beans and some cut up organic broccoli, my ode to health. And fresh raspberries and blueberries from the farmer’s market for dessert (I simply could not help myself). They loved it, I loved helping and I of course scored points with my adult children who were filled with awe and gratitude. If I can make a family happy with this kind of food, I’m all in. Ahem, to clarify… “loose meat” is a term we used in Iowa where I grew up. 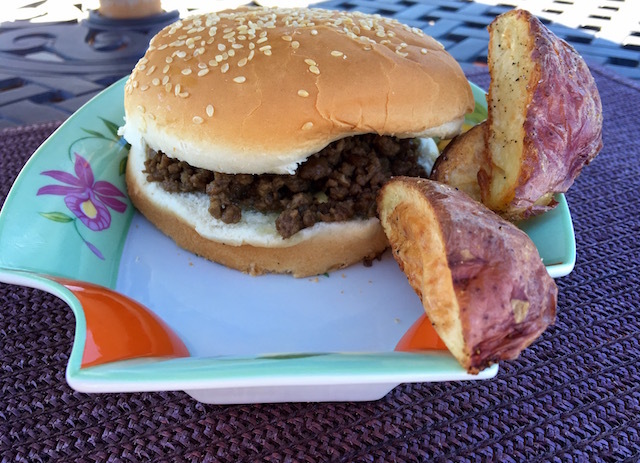 Loose meats and Maid-rites are akin to sloppy Joes without the sloppy sauce. We also called these Maid-rites, and you can read about them here. I’m sorry for all of you who have never experienced a Maid-rite or dined at the now defunct “Ye Old Tavern” owned by the Kaleds, a dinette near my high school in Sioux City, Iowa. I cannot even begin to describe my memories of these delights – how amazingly perfect they always tasted and how much fun we had visiting my aunts in Marshalltown, Iowa. We’d always go the the Maidrite diner and watch the plump farmers, overalls and tee shirts, downing 3 or 4 at a time. Thankfully I got to have Maid-rites this past summer while back for a family event in Des Moines. The ones I concocted are close to how they taste in Iowa, though. And true to the original Maid-rites, you do not ever put ketchup on these! 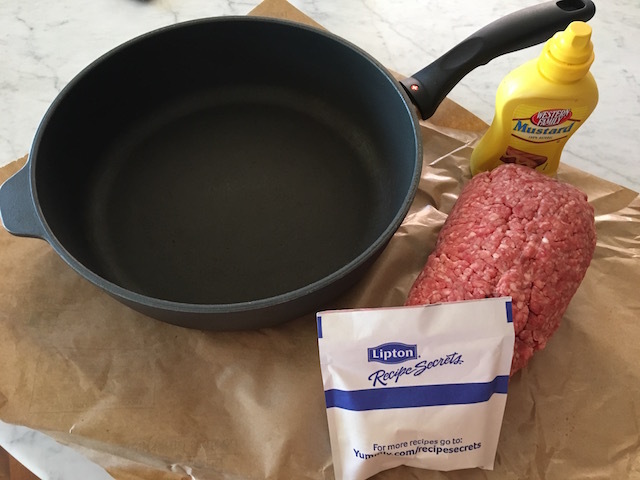 Simply squirt some French’s mustard on the bun or top with raw sweet onion. Heat a large (10-12 inch) deep-sided saute pan on medium high. Brown the ground beef, turning and chopping up the meat to brown and separate on all sides and not have chunks stuck together. Barely cover the browned meat with water and bring to a boil. Add mustard and soup mix and stir well. Put on the fan and continue to boil on the stovetop uncovered until most of the water is absorbed – this takes me about 30-40 minutes. Scoop cooked meat onto fresh hamburger buns. Serve with picnic type side dishes…beans, potato salad, pickles, cole slaw, whatever your heart desires. And if you make a huge batch and put the leftover meat in leftover buns and wrap them well in waxed paper, they taste marvelous, cold or reheated for lunch. This entry was posted in Meat and tagged Maid-Rite, Sandwich. Bookmark the permalink.